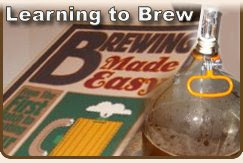 That being said, while taking a break from the feedings and changings that seem to take place every two hours, I did a little beer blog surfing and stumbled upon this month's Session. Enjoy that special beer you normally only open on your wedding anniversary or birthday. Either way, tell us about it. Why is it a beer you may only drink once a year? 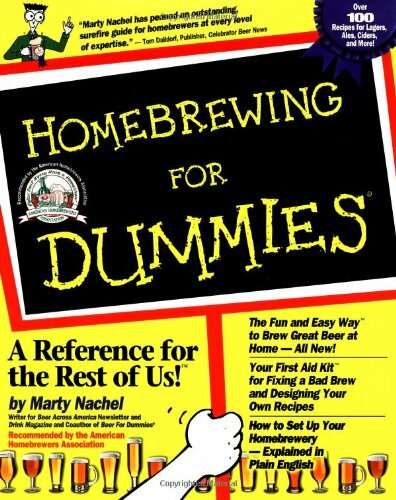 Why is that brewery’s annual release the one you selected? 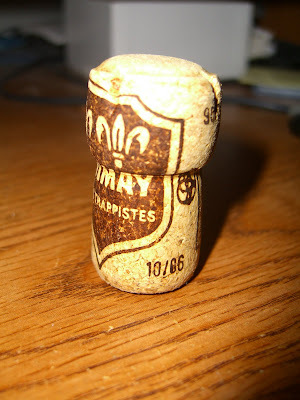 This was the last Chimay Blue on the shelf, and it was covered in dust... A little vintaged, but I wonder how good of a find this was? Either way, a great beer to enjoy on my boy's one week birthday! 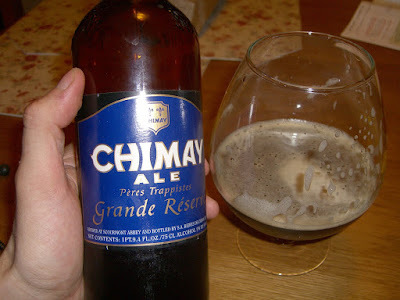 I actually HAVE a birthday to celebrate, and instead of hitting up an anniversary beer, I chose a dusty bottle of Chimay Ale Grande Reserve that was hiding on a lonely shelf at the local package store. 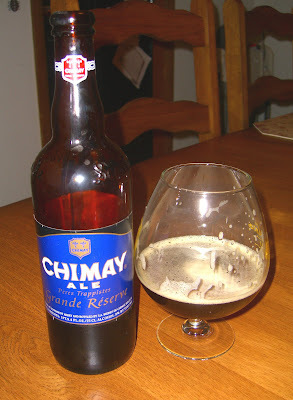 (Vintage October, 2006) Apparently Chimay Blue ages very well, this one sure was delightful! The idea of quality beers made by men of God really appeals to me on many different labels. 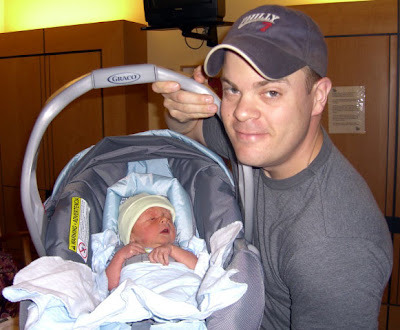 And I could not think of a better way to celebrate my baby boy's one week birthday then by enjoying one gift from God in celebration of a greater gift from God. 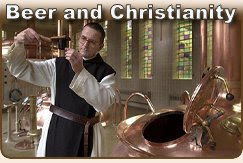 Read more about my thoughts on beer and Christianity here. 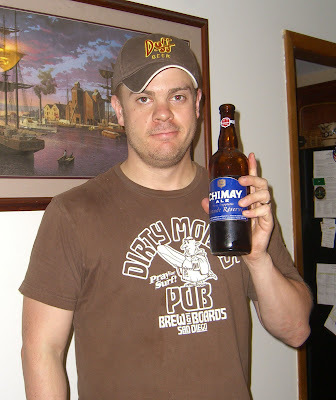 I'm all class, with my Target brand "Dirty Monk Pub" T-Shirt and my Simpsons's Duff Beer hat, the perfect outfit for sipping a truly magnificent Belgium Ale, made by real honest to goodness monks. Read up on the holy men of the Notre-Dame de Scourmont abbey in southern Belgium. 75 cl, 33 cl (25.4 fl.oz., 11.2 fl.oz. ), 9% alc. vol. Named Grande Réserve in 75 cl (25.4 fl.oz.) bottles, it is principally distinguished by its character of a strong beer. Its flavour, noticed when tasting it, only accentuates the pleasant sensations perceived in the aroma , while revealing a light but pleasant touch of roasted malt. 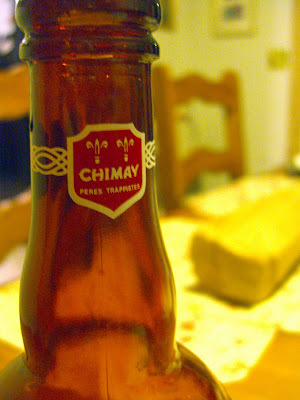 This top fermented Trappist beer , refermented in the bottle, is not pasteurised. I don't have the right glassware for this sort of beer. The closest thing I have is an old glass from a tropical drink enjoyed in Hawaii. Is this blasphemy? Glass: A unique glass, lets call it a brandy snifter, yeah that's it... It's the best glass I could find! 1. Appearance - Dark and cloudy amber/carmel brown with a light tan head with some lacing. 3. 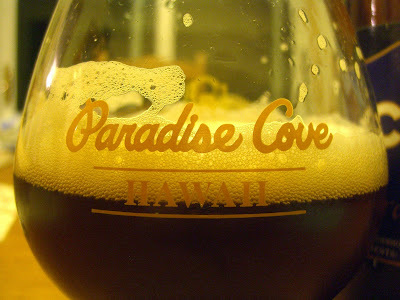 Taste - Malty, sweet like raisins bread and a hint caramel with some nutty and oak undertones. Damn tasty, better when it's not so cold, only slightly chill this brew. As it warms the flavor improves, but hints of the alcohol sitting beneath the surface become slightly more detectable. 4. 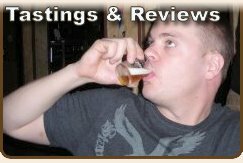 Mouthfeel - Medium to heavy bodied, perhaps a little chewy, and moderately carbonated. Crisp yet creamy. Goes down fairly easy, but should be savored.